Richmond American Homes - "James Model"
Before stepping through the door, you’ll immediately feel welcomed by the charming front porch and well-maintained exterior of this Highland’s Ranch Home. The cathedral ceilings and open floorplan creates a bright and inviting atmosphere. Entertaining will be a breeze with this large kitchen featuring double ovens, hardwood floors, and kitchen island overlooking the family room with oversized picture windows and gas-burning fireplace. finished and walks out to the fenced-in backyard with a deck that exposes amazing views of the majestic Rocky Mountains. 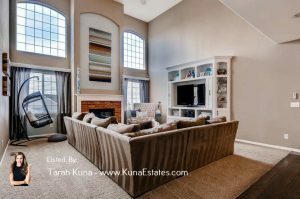 Beautiful property in Highlands Ranch to call home!